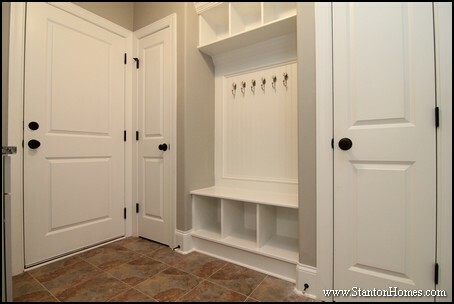 Looking for the names of inderior door styles you've found on Houzz, Pinterest, and your favorite home design websites? We've compiled photos of the most popular new home interior door styles - with photos of each design! 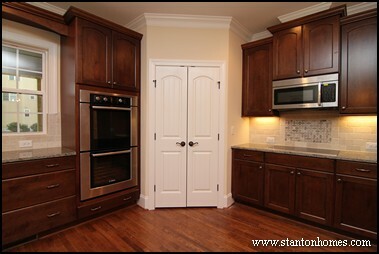 Photos of popular doors styles are taken from different custom homes built by Stanton Homes in central North Carolina. How will you know an interior style when you see it? 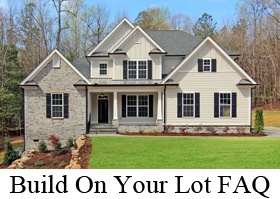 Generally, the number, shape, and size of panels will distinguish each door style. 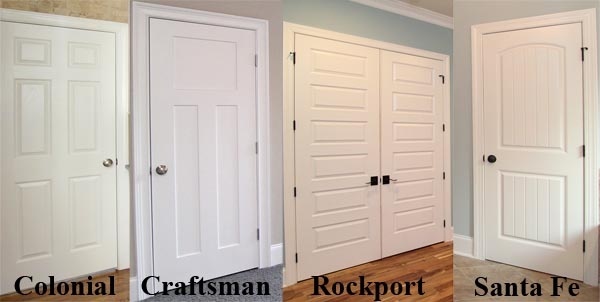 Interior Door Style #1: "The Rockport"
The Rockport interior door style has a unique design with at least five rectangular panels in a horizontal row. Interior Door Style #2: "The Craftsman III"
The Craftsman III interior door style is a contemporary take on craftsman design. The door style has three panels - one rectangular panel on top and two parallel panels below. 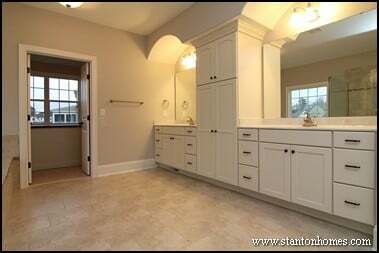 Interior Door Style #3: "The Santa Fe"
Recently, we've seen a lot more requests for "The Santa Fe" style door in Raleigh custom homes. The Santa Fe interior door style is multi-dimensional - with radius top arch and five distinct panels above and below the mid rail (also called lock rail). Interior Door Style #4: "The Provincial"
A Provincial interior door has four vertical panels with a cathedral arch split into the top two panels. A cathedral arch has an extra "dip" in its curve, adding more attraction to the door. Interior Door Style #5: "The Avalon"
The Avalon interior door design has three rectanglular panels - a large panel on top, thin in the middle, and medium on bottom. Interior Door Style #6: "The Cambridge"
Cambridge style doors tend to look more contemporary, with simple and clean lines. 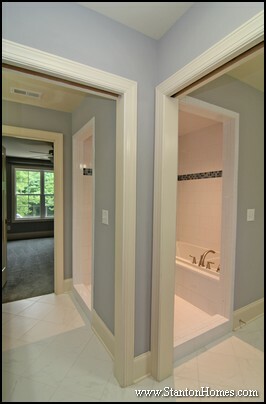 The Cambridge door uses two raised panels, with a larger panel on top and smaller panel on bottom. 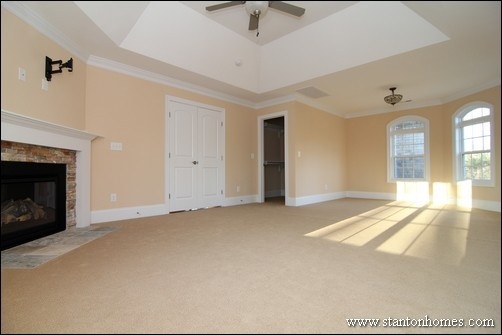 Interior Door Style #7: "The Continental"
Continental doors are very popular in new homes. 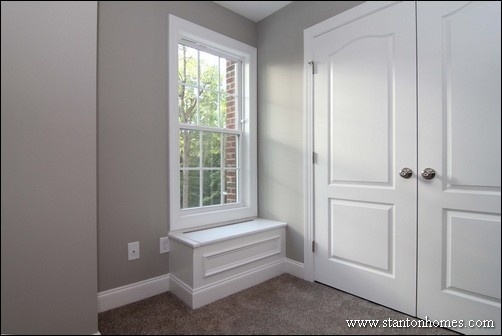 The curved top piece sets the door off, giving it more dimension against the straight lines of trim. 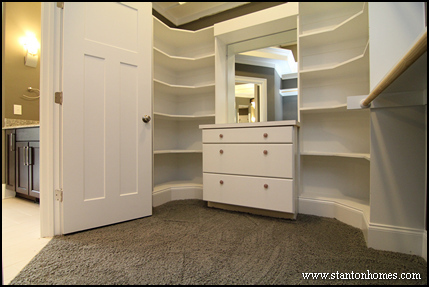 Interior two door entries are scaled so that each door is thinner than a "standard width", but the total distnace is often wider. Interior Door Style #8: "The Colonial"
A Colonial door style, sometimes called "Bostonian," has six raised panels. If you love classic American architecture, this may be the perfect door style for your new home. Interior Door Style #9: "The Princeton"
The Princeton style uses a full cathedral arch (instead of the split cathedral arch in the provincial style). 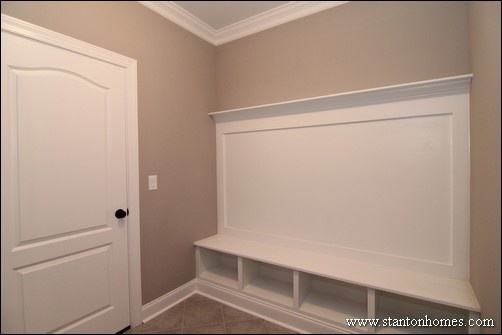 The curved top of this Princeton mud room door contrasts with the built in drop zone and bench trim, emphasizing the architectural appeal of both styles. 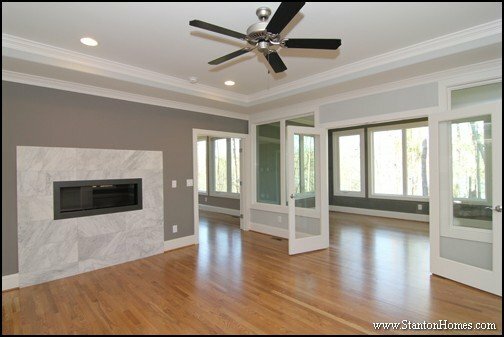 Interior Door Style #10: "The Atherton"
Clear glass French doors are a great choice for interior separations between the living room and sun room; master bath and bedroom; and mother in law suite and living or sitting room. 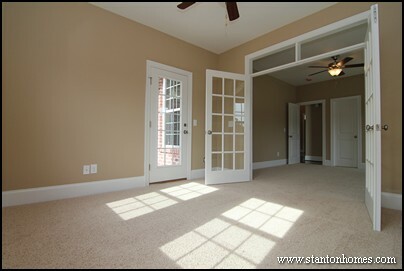 See examples of French doors with and without grids, below. 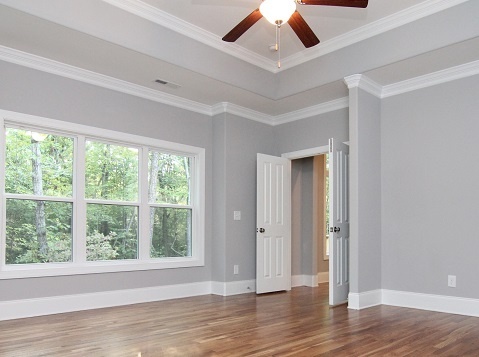 See where pocket doors matter most in a floor plan layout, in these photos. 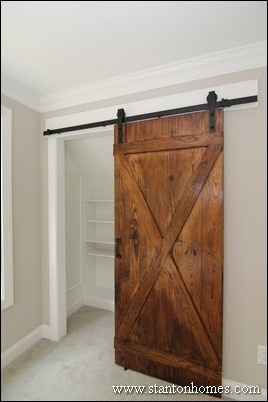 Barn Doors are hugely popular right now - and we credit HGTV for spreading the trend. Before you install a sliding barn door, read these 5 questions to ask about barn doors. 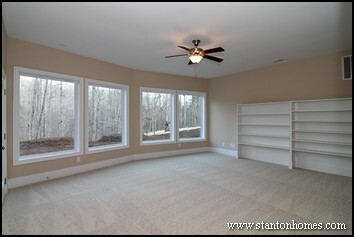 Here's an example of a custom, hand-built bard door in an NC new home in Pittsboro, Chatham County. What Kind of Kitchen Countertops Work Best? 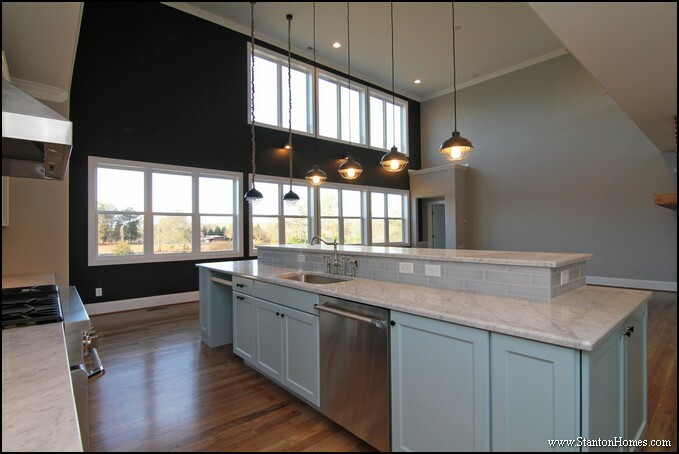 Granite, marble, concrete, tile or solid surface – compare and contrast the most popular kitchen countertop selections for North Carolina new homes. 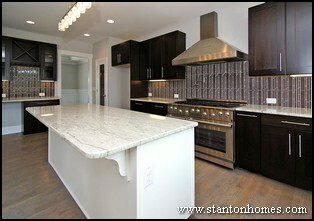 And get an idea of how to calculate the cost of your kitchen countertops, in a North Carolina new home. 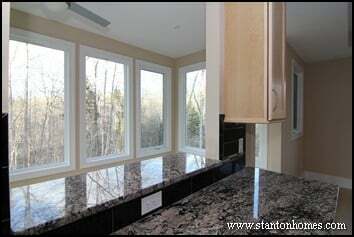 Granite Countertops – Which Kitchen Countertops Work Best? Granite is a natural product harvested from quarries. Colors and patterns vary depending on the geological processes in the region where they are quarried. 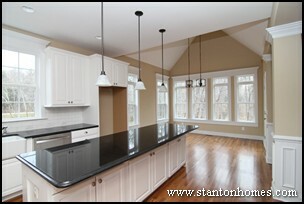 Granite is a higher-end home counter top option, with prices starting at about 3-4 times the cost of laminate. Because this is a natural material, selections are not made from a color chart. 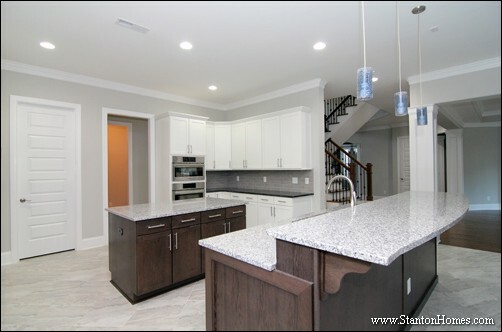 Buyers can select from samples representative of a type of granite, or choose a unique individual slab from which their countertop will be carefully cut. There are a variety of edges – including bullnose, radius, straight, bevel, and ogee. See a chart of counter top edge styles here. Granite is fairly resistant to heat and scratches. If damaged, it may be possible to polish the countertop, since it is made of the same material throughout. The material must be resealed about every five years to protect it from stains, and careful attention must be paid to the natural stone seams. If you use granite in the kitchen, you'll want to consider tile back splash options. One of the best ways to add designer appeal to your kitchen without spending a lot of money is adding a tile backsplash above your granite tops - see 5 popular tile designs here. 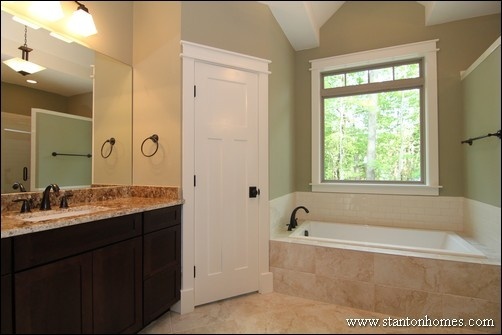 Should I install granite in the master bathroom? 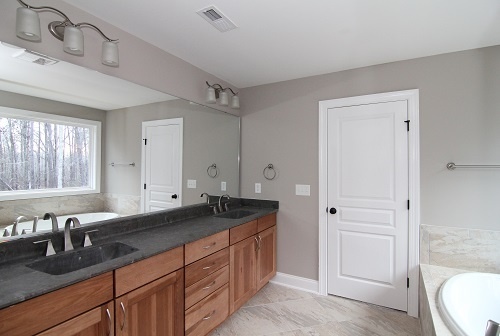 Since the cost of granite has gone down over the past few years, upgrading to granite in the master bath may be more reasonable than you might think. Marble Countertops – What is the best type of Kitchen Countertops? Like granite, marble comes in slabs that are always different because they come from a natural source. In this NC new home kitchen, White Carrara Marble countertops are paired with a light blue island. It is not as popular as other kitchen countertop materials, because it’s lime-stone base makes it less resistant to stains from oils and acids. The cost of marble is a little higher than granite, and the seam and sealing processes are identical. This is one of the newest countertop products, and is becoming increasingly popular. Quartz is actually a quartz composite, made of quartz, colored pebbles, polymers, and epoxy. About 97% of the composite is quartz. The other 7% is pigments and resins. Natural granite is only about 50% quartz, which is very high on the hardness scale – only diamonds, topaz and sapphires are harder! 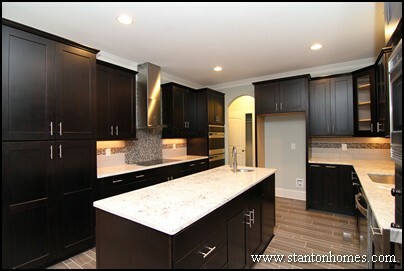 Quartz comes in many more colors than natural stone and has a more even pattern. The cost is higher than granite. 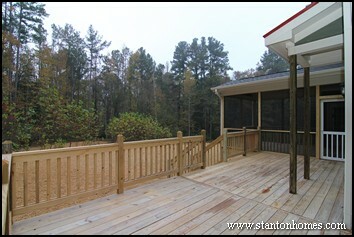 It doesn’t need to be sealed, and is more resistant to stains, scratches, and other damage. Seams are less noticeable due to the consistency of the pattern. 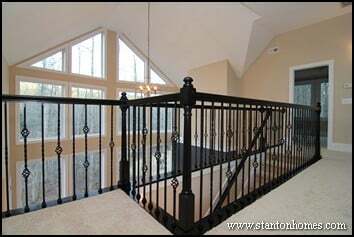 Stainless steel is also becoming a popular option in higher-end homes. It is one of only a few countertop materials that can be safely bleached, and heat will not hurt it. Brushed and/or textured finishes are available to help hide scratches. 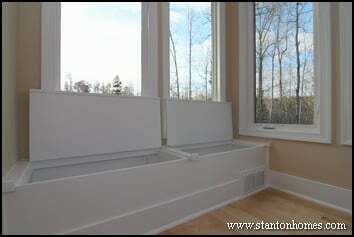 In some cases, the sink can be created with the countertop for a totally seamless one-piece installation. 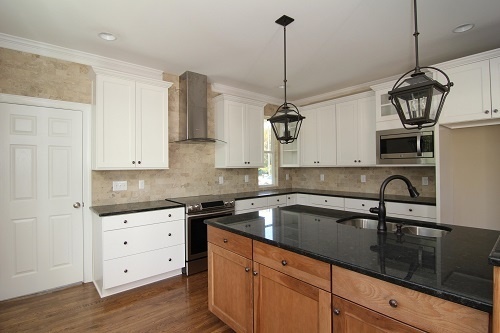 All this comes with a price tag – steel countertops cost about twice as much as granite. 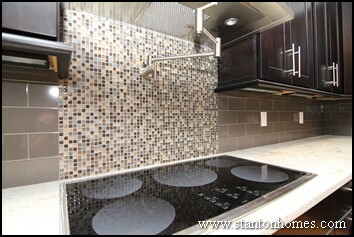 Tile was a big design feature in 1980's and 90's kitchens (along with wood counter tops). While we don't expect to see a wave of tile kitchen counter tops again soon, homebuyers have begun to request tile counter tops in the bathroom. 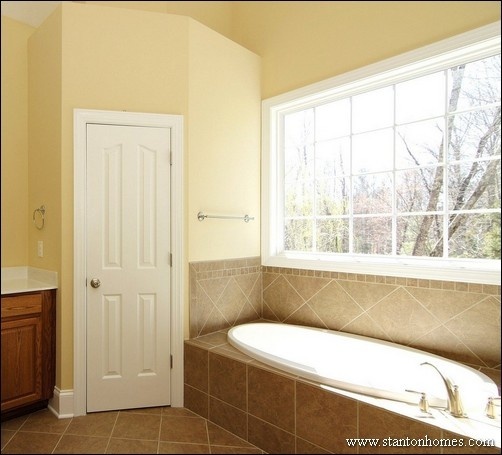 Click here for photos and design ideas for tile bathroom counters. What’s the bottom line on countertop costs? All countertop pricing is determined by square footage. 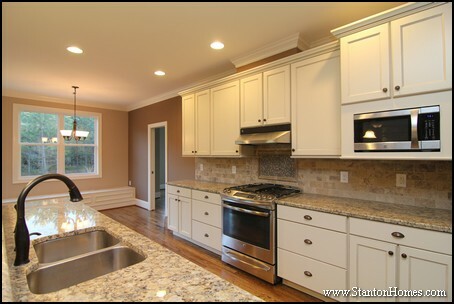 Most standard countertops are 2 ¼ feet wide. To find out how much countertop you need, take the length of the countertop and multiply by the width. 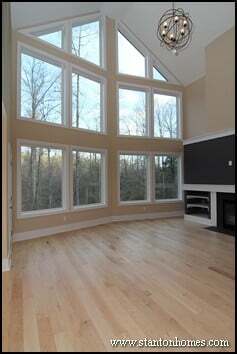 Then multiply the total square footage by the cost per square foot for the desired material. This will give you the starting point. But there are additional considerations as well. The cost of backsplashes depends on material and style, as does the edge of the countertop – which can all be customized in different materials. 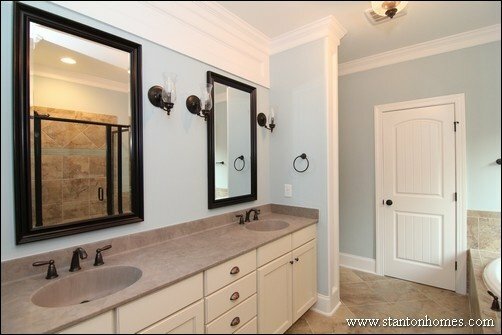 Even the type of sink makes a difference in countertop cost. An under-counter mount requires a more finished edge around the sink, which raises the cost for some materials. 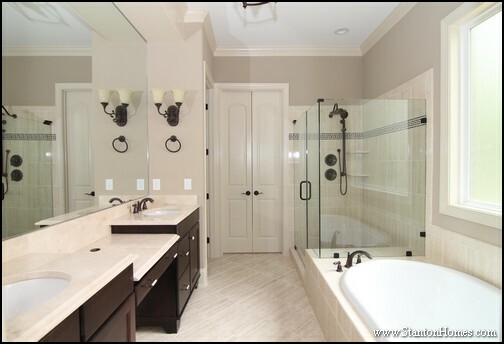 Additional sinks or other cut outs can add to labor and installation expenses, as well. 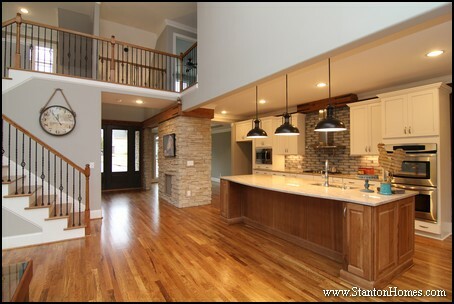 Custom home builders like Stanton Homes can walk you through the costs when you plan your home, so you can decide what kind of countertop you want to live with. The top 5 kitchen design trends for homes are all about details, according to a survey conducted by the National Kitchen and Bath Association (NKBA). The NKBA identifies the latest designs and trends in kitchen and bath design across the United States and Canada. More than 300 NKBA member-designers participated in the 2013 NKBA Design Trends Survey, providing information about popular design specifications including materials, product types, and styles. 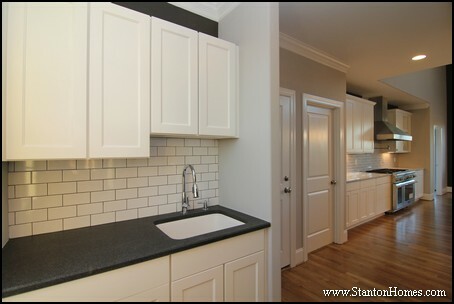 White painted cabinetry is the number one kitchen trend going into 2013. 67% of NKBA respondents said they use white painted cabinets in the kitchen. 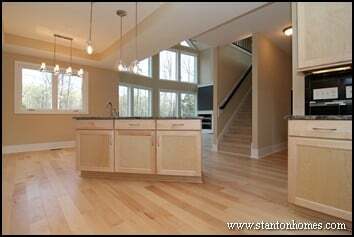 In the Triangle area of North Carolina, custom home builder Stanton Homes is starting to see more requests for white cabinetry. 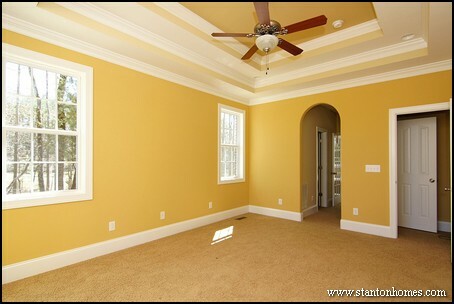 The approach can lighten a room, make it look bigger, and provide a clean and fresh look. There is also still a very strong desire for classic stained wood cabinets, with cherry wood the optimal choice for durability. While ceramic and porcelain tiles remain the most popular tile backsplash in the kitchen and bathroom, glass backsplashes are growing more popular, with 64% of respondents saying they use this design approach. 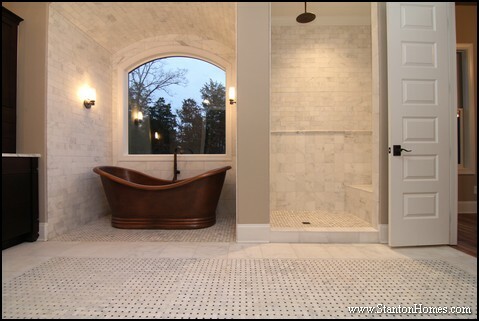 Natural stone tile is another growing trend. The use of LED (light-emitting diode) lighting increased to 77% of designers in 2013. LED has become an extremely popular type of energy efficient lighting, and is especially prevalent in many certified green homes. LED lighting is still much more expensive than standard lighting, but some buyers consider this a must-have splurge in important areas like kitchens and baths. While touch activated faucets showed the highest growth in popularity by users, pull-out faucets and pot fillers are also becoming more popular in 2013 homes. Polished nickel and chrome have lost some of their shine; satin nickel and oil-rubbed bronze have taken the lead in growth in popularity. 60% of respondents use satin nickel finishes in the kitchen, with 50% using bronze/oil-rubbed bronze.